Tom Fred Tenney, known as T. F. Tenney (December 6, 1933 – June 1, 2018), was a Pentecostal clergyman from his native Louisiana, who began preaching at the age of sixteen. YouTube has five thousand of his entries with sermons and excerpts. His Twitter accounts listed more than 44,000 followers. He was writing a thirteenth book at the time his death in Alexandria at the age of eighty-four. Tenney was the younger of two children born in DeRidder in Beauregard Parish to Fred Eugene Tenney (1901-1968) and the former Jennie Veve Nichols (1904-1988). In 1952, he married the former Thetus Caughron in West Monroe in Ouachita Parish, Louisiana. A few weeks later, the couple, still teen-agers, was elected to the pastorate of a newly formed church in Monroe. The Tenneys named their ministry "Focused Light." 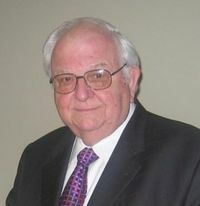 From 1954 to 1960, Tenney served as youth president of the Louisiana District of his United Pentecostal Church International. In the 1960s, as the international youth president for UPCI, Tenney relocated his family to St. Louis, Missouri, where the Pentecostal headquarters are located. In January 1970, Tenney took over the post of Pentecostal foreign missions director, which required extensive world travel. In 1975, the Tenneys returned to his native DeRidder, at which for three years he was the pastor of the local First Pentecostal Church. In 1978, with the death of district superintendent C. G. Weeks, Tenney was named the interim district superintendent. Soon elevated to district superintendent, with supervision of three hundred churches and eight hundred pastors. He remained in that position until May 1, 2005, at which time he retired at the age of seventy-one from denominational affairs. He kept the role of bishop emeritus of the state denomination. From 1978 until his death, the Tenneys resided in Rapides Parish, first at Tioga on the District Campground, and then in Alexandria. In his last years, he had continued to travel and preach and teach throughout the world. The Pentecostal denomination described Tenney was "a valiant and faithful soldier of the Lord, leading and serving this district, the UPCI, and churches around the world. He will be greatly missed by all of us, but we rejoice with this mighty man of God as he has met his Savior. "On December 6, 2016, Republican U.S. Senator Bill Cassidy of Louisiana invited Tenney to deliver the opening prayer of the Senate session that day. A Democrat, Tenney was close to former U.S. President Bill Clinton, whom he invited for special services at the Pentecostals of Alexandria. Democratic Governor John Bel Edwards ordered national and state flags to fly at half-staff on June 5, the day of Bishop Tenney's funeral. He is interred at Forest Lawn Memorial Park in Ball near Pineville in Rapides Parish. Tenney's son, Tommy Tenney (born 1956), is also a Pentecostal clergyman and prolific author in Alexandria, Louisiana. ↑ Tom Tenney, 71303, December 1933. Louisiana Secretary of State. Retrieved on June 4, 2018. ↑ Fred Eugene Tenney. Old.findagrave.com. Retrieved on June 4, 2018. ↑ 3.0 3.1 3.2 Bishop Tom Fred Tenney's obituary. The Alexandria Town Talk (June 3, 2018). Retrieved on June 4, 2018. ↑ 4.0 4.1 4.2 La. Pentecostal preacher T. F. Tenney dies. 'Tthe Alexandria Town Talk (June 1, 2018). Retrieved on June 4, 2018. ↑ Gov. Edwards Orders Flags at Half-Staff in Honor of Bishop T. F. Tenney. Louisiana.gov (June 4, 2018). Retrieved on June 5, 2018. This page was last modified on 9 September 2018, at 00:34.